BRAND NEW Open Plan Building, 2 doors, 6 windows & perimeter fascia. Our best selling buildings! BRAND NEW Building supplied with 2 external doors, 8 windows & full width partition, our top seller! BRAND NEW Open Plan Building, 2 doors, 8 windows & perimeter fascia. Our best selling buildings! BRAND NEW OFFICE UNITS! Open Plan, 1 door, 2 windows, full electrics, top quality & value! BRAND NEW Open Plan Building, 1 door, 6 windows & perimeter fascia. REDUCED FROM £14,950! BRAND NEW Building with Large Open Plan Office & Welfare Module with Toilets & Kitchen. BRAND NEW Open Plan Building supplied with 1 external door, 4 windows, excellent value! BRAND NEW Open Plan Building supplied with 1 external door, 8 windows, excellent value! BRAND NEW CANTEEN UNITS! Full electrics, sink, worktop & water heater, top quality & value! BRAND NEW, Stacked Office Modules with Staircase, stock units, amazing quality & value! BRAND NEW Open Plan Building supplied with 1 external door & 6 windows, excellent value! BRAND NEW Toilet Units, Composite Steel Construction, Fully Plumbed and Ready for use! BRAND NEW Toilet Unit with 3 Male & Single Female/Disabled Facilities. Excellent Value! 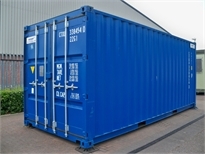 AS NEW Shipping Containers, Excellent Value, BLUE & GREEN units in stock & available! BRAND NEW Steel Secure Stores, BLUE & GREEN units in stock and available, excellent value!